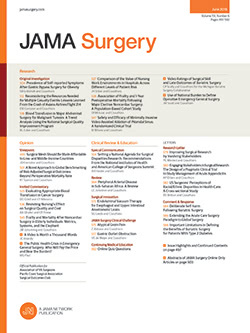 In the Original Investigation entitled “Evidence for a Standardized Preadmission Showering Regimen to Achieve Maximal Antiseptic Skin Surface Concentrations of Chlorhexidine Gluconate, 4%, in Surgical Patients” published online August 26, 2105, and in the November 2015 issue of JAMA Surgery,1 2 authors should have reported additional commitments or financial relationships. In the Article Information section, the Conflict of Interest Disclosures statement, which was given as “Drs Edmiston and Seabrook report receiving grant support from Clorox Healthcare. No disclosures were reported.” should be replaced with “Dr Edmiston reports receiving unrestricted research grants to support laboratory personnel and supplies in the study of microbiology, antisepsis, and infection from CareFusion, Clorox Healthcare, Irrimax Corporation, and Sage Products; paid consultancies for providing expertise, analysis, and leadership for health care initiatives and regulatory activity for the Food and Drug Administration expert panel on infection control implications of biomedical devices; paid consultancy for a Wisconsin Division of Public Health and Centers for Disease Control and Prevention grant related to surgical site infections reduction; paid expertise for the Florida Hospital Association on surgical site infections reduction; serving as an uncompensated member of the Credentialing Board of the Infusion Nurses Society; and paid lectures or presentations to health care professionals for which an honorarium or travel expenses were provided by the Association for Practitioners in Infection Control and Prevention, CareFusion, Clorox Healthcare, Ethicon, Inc, CareFusion, the Florida Hospital Association, and the Society of Gastroenterology Nurses and Associates, Inc. Dr Leaper reports being a paid member of advisory boards; being a paid consultant for Ethicon, Inc; and receiving reimbursement for lecturing about research concerning a wound dressing by Altrazeal Trading GmbH. Dr Seabrook reports receiving grant support from Clorox Healthcare. No other disclosures were reported.” This article was corrected online.